Guateng Province’s Government expects to complete the building of a new 80 km rail link between Johannesburg, Tschwane and Johannesburg International Airport by 2010, in time for the Football World Cup. The Bombela Consortium has been selected to negotiate the concession contract for the Gautrain Rapid Rail Link, as it will be called. The new link will have ten stations and will also benefit from a bus feeder system. 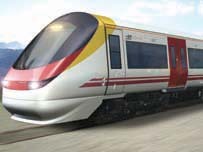 Bombardier Transportation is a lead member of the consortium and as well as undertaking most of the electrical and mechanical engineering work they will also supply the Electrostar vehicles, which will operate the rail service. Bombardier’s Derby works will be responsible for manufacturing the fleet of Electrostar vehicles, with final assembly taking place in South Africa. Financial negotiations for the public/private partnership will include financing, design, construction, operation and maintenance. The negotiations began last month and are expected to continue into next year. Bombela Consortium members, as well as Bombardier Transportation also include Bouygues (the French contractor), RATP Developpement (the major Paris rail/bus operator), Murray Roberts (South African civil engineering contractors), Lolwe (rail contractors) and Lolwe Express. The two latter named are partnerships of South African companies.